Printing inks makes use of the whiteness of the paper to create a color impression. The inks have a degree of transparency that can be calculated by an ISO-standardized test method (ISO 2846). A consequence of printing with transparent inks is that the printed color will depend on the color of the substrate: printing on a neutral colored paper stock delivers different colors as when printed on a bluish paper with optical brightening agents (fluorescence). Fig. 1. The effect of printing with transparent inks. A magenta ink layer on a neutral colored paper produces a reddish tinted magenta. The same ink layer printed on optical brightened paper, results in a bluish tinted magenta. A first step is the ability to predict the influence of the paper color on the printed result. ISO 12647-2, annex B describes the mechanism of ‘substrate correction’. By measuring the color of the production papers, differences in paper color can be handled. 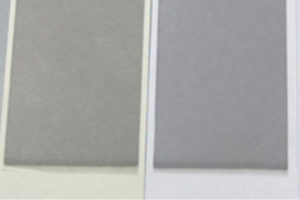 Testing ’substrate correction’ by printing a gray pantone color ink on a yellow and bluish paper shows promising results: color prediction and measurement were almost identical. Fig. 2. Testing substrate correction by printing a gray pantone ink on 2 different paper stocks. It may be clear that bright color inks (pastel colors) are more prone to differences in paper color then dark color inks: black will remain black on both substrates. Printing dark spot colors have the extra difficulty that a thick ink layer is needed in order to reach the specified dark color. Color shifts, caused by printing transparent inks on multiple paper stocks means a dilemma for the printer: do I want to modify ink formulations to compensate for the printing substrate and still achieve the target brand color? Or do I stick with the default (unmodified) ink and tolerate the color differences caused by the substrate? The first option often leads to a database filled with ink-recipes for thousands of colors for different substrates. This approach brings complexity in the print-workflow. Can you manage to always select the right recipe for the job? Is your ink mixing equipment stable enough to deliver the right ink colors time after time? Are the quality control tools in accordance with color numbers in the ink recipe database? Paper stocks can have an identical color but different surface types. It is the paper surface that has a profound effect on the printed brand color. Typically, paper surfaces are grouped as coated and uncoated substrates. Coated papers have the ability to keep the ink layer on top. Uncoated papers absorb ink into the paper fibers, resulting in a poorly structured ink surface on top. Consequences are almost no gloss and less color chroma. The Pantone Coated and Uncoated Color Guides are examples of how a color ink produces different results when printed on 2 different paper surfaces. Fig. 3. Pantone color ink on coated and uncoated paper. Brand colors are defined mostly as Pantone color numbers. Sometimes CMYK alternatives are present, but with no further print specifications. Hereby the brand color guide serves purely as a simple form of color communication between the brand owner and designer. When it comes to real life printed products, the brand manual cannot be used to uniformly communicate between brand owner and printer. The mathematical system of specifying colors can be of great help in handling the print production of brand colors. Chromaticity coordinates and color difference formulas have evolved to reliable tools for quality control. Everything is there to measure, calculate and communicate colors between the different stakeholders in the process of printed brand colors. The 4 statements show the complexity and opportunities in printing brand colors. A step forward is the concept of a ‘master’ color and derived consistent printed colors. As printed color is limited by the printing materials (transparent inks, substrate surfaces), there is a need to specify multiple printing conditions. Coca Cola Red will look different in a glossy magazine and newspaper. The goal for the printer is to print consistent brand colors. This means that regardless of the printing limitations it has to cause a customer recognition of the brand color . To control this process, color mathematics are a necessity. They can support printer, designer and brand owner in specifying appropriate color targets and tolerances. Fons begon zijn carrière als service engineer bij de KODAK Graphic Division in Brussel. Na 2 jaar trad hij in de wereld van de kranten in de CONCENTRA groep: eerst als de coördinator voor de afdeling "Imaging" en later als de grafische/technische specialist. 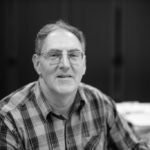 Sinds 11 jaar is Fons senior consultant bij VIGC. In deze functie voerde hij talrijke projecten op kleurmeting & normalisatie, publiceerde meerdere papers en doceert print professionals in de wereld van kleur.